Lahore: Minar-e-Pakistan was lit up in rosy pink lights to symbolize support for breast cancer awareness month, and in solidarity of patients and survivors on occasion of International Mammogram Day. 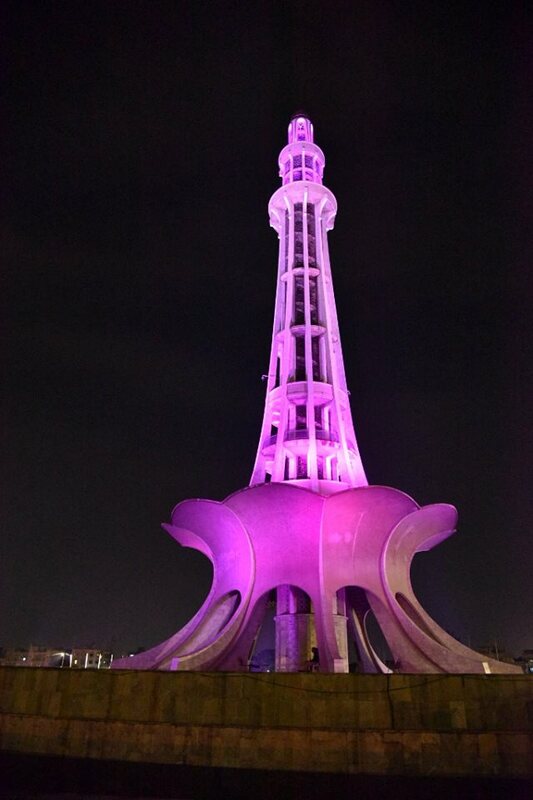 This initiative by Pink Ribbon Campaign with support of Mobilink and Parks and Horticulture Authority (PHA) is in accordance with international support for ‘Pinktober’, which has seen famous monuments such as Empire State, White House, Eifel Tower and Sydney Opera House also turning pink. The Famous Centaurus Mall in Islamabad was also turned pink earlier this month. Pakistan has the highest rate of female breast cancer in Asia, as one out of nine Pakistani women is likely to suffer from breast cancer at some point in life. Approximately 90,000 cases of breast cancer are reported every year in Pakistan and about 40,000 women die from this deadly ailment. More than 90% women have a chance of surviving breast cancer with early diagnosis; however due to lack of awareness and medical facilities women are diagnosed at later stages, which is the prime reason for the high mortality rate. Chief Executive – Pink Ribbon, Omer Aftab thanked PHA and Mobilink for supporting the cause. Speaking about the importance of Pink Illumination, he said that early detection is key to survival. He mentioned that the issue of Breast Cancer still has cultural sensitivities attached with it, but we need to raise this issue more and more in media. It is important for the entire society to realize the importance of awareness and early detection to save lives of a mother, a sister, a wife or a daughter. He added that Pink Ribbon is setting up Pakistan’s first dedicated Breast Cancer Hospital. Director Public Relations – PHA, Javed Shaida appreciated the initiative taken by Pink Ribbon, adding that lack of awareness about health issues cause problems. He also stated that PHA would continue to extend its support for such noble causes. October is internationally celebrated as ‘Pinktober’ – the Breast Cancer Awareness Month. During this month, Pink Ribbon is not only going to spread awareness among young female students through information material, but also organize various events to sensitize women and girls at the community level through direct interaction. Furthermore, ‘Pinktober’ 2015 is running different activations throughout October to increase maximum awareness and survivorship care to build a strong network of prevention and hope.